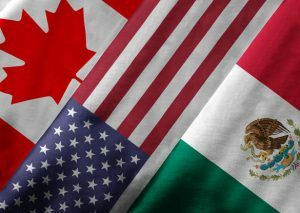 Today is supposedly crunch time for negotiations between the U.S. and Canada to reconfigure the North American Free Trade Agreement (NAFTA). With the imminent departure of Mexican President Enrique Peña Nieto, a deadline of this Friday has been set to conclude a deal or Mexico and the U.S. have threatened they will go it alone. The deadline is to ensure that Peña Nieto could sign the deal with President Donald Trump before he hands over power to his successor Andrés Manuel López Obrador, the Financial Times reported. Peña Nieto and Trump have, it appears, reached an agreement — subject to ratification by their respective governments — that both sides can accept. But Canada still has many sticking points that have been the topic of fierce debate as the deadline looms. A key part of the Mexico-U.S. agreement is that a minimum 75% of the content making up cars manufactured in Mexico and imported into the U.S. would in turn have to be made from U.S. manufactured components in order to qualify for duty-free entry into the U.S. In addition, 40-45% of the workers employed on those manufacturing lines in Mexico would have to be paid a minimum wage of $16 per hour, which represents an effort to level the playing field between higher-cost workers in the U.S. and low-cost workers in Mexico. Such a condition would not present a problem for Canadian workers, but the sticking point for Canada is not so much around employment costs in the auto industry as it is the wider renegotiation of NAFTA terms impacting other industries. The Financial Times picks out Canadian concerns over protectionism for the dairy industry, investor dispute settlement procedures, and the U.S.’s continued imposition of national-security-based tariffs on steel and aluminum imports. Both sides appear reasonably optimistic that the deal will be struck. However, quite how these issues will be resolved and whether the import tariffs on steel and aluminum will be dropped remains to be seen. Meanwhile, the E.U. has surprisingly made an offer to remove all tariffs on cars in a free trade deal with the U.S., the Financial Times also reported this week. Cecilia Malmstrom, the E.U. trade commissioner, said Brussels would negotiate the zero-tariff deal on cars if the U.S. reciprocated. The move was interesting in view of Trump’s earlier focus on the auto sector when criticizing U.S.-E.U. trade terms, saying that he saw the U.S. car industry as being unfairly treated by the E.U., which has imposed a 10% tariff on imports of passenger cars from the U.S. compared to U.S. duties of 2.5% on imports of E.U. passenger cars. U.S. import tariffs on other auto products, such as pickup trucks, are much higher than the 2.5% passenger car threshold. Nevertheless, the E.U.’s offer to bring all car tariffs, passenger and pickup, to zero if the U.S. will reciprocate could herald a wider move to remove even current modest tariffs between the two as part of a wider agreement.